Greatest challenge during the build (as always) is coming up with a new and clever design. As for construction, all the parts were cut out on my CNC router – everything fits together in pockets, grooves and tenons as to make the whole chair just get glued together. I used a few 16 gauge pins to hold things together while the glue dried. 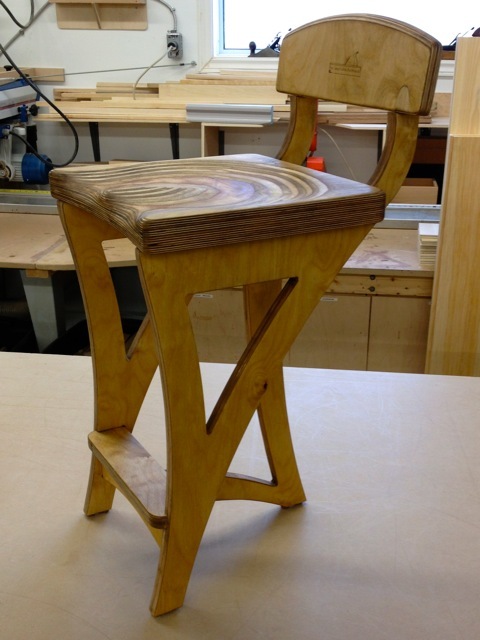 My idea with this stool (as it was to be a “shop” stool…) was not to use anything fancy – just make a solid, useable stool that I could use daily to eat my lunch, use to sit at my workbench to do figuring and cut lists, etc rather than stand up. The three-point contact with the uneven shop floor guarantees a rock-free seat. Looking through the entries, so far, this one work best for me. It fits the “shop stool” category well. It’s of simply but appropriate materials. It well executed and highly functional. Even looks comfortable for longer sessions sitting in the shop. Great job! This is beautiful it wouldn’t be out of place in a workshop or my kitchen! Love how you showed the beauty of plywood when the layers are exposed and finished. This is a good design.